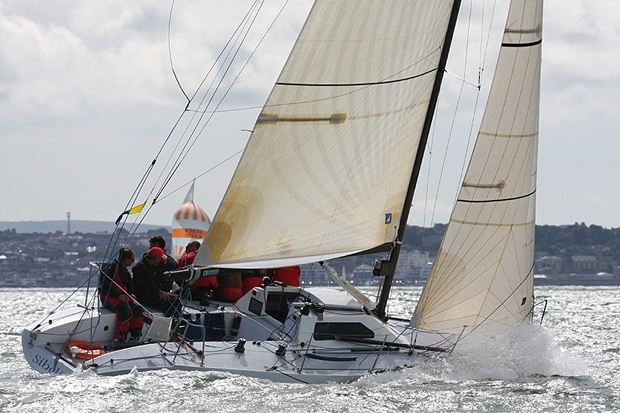 The old adage that things become better with age has never been more apt than in Cowes this week, where a 38 strong fleet of historic little yachts racing in the 2011 Half Ton Classic Cup supported by South Boats has been enjoying a wonderful fifth edition of this revival event. The boats may be old but their hearts are still strong and it's great to see not only superbly close racing on the water, but also the wonderful camaraderie of the crews ashore. Today's fourth day of competition in the five-day regatta featured three more races, bringing the total number sailed to ten. With rain and no wind greeting the bleary eyed crews as they pulled back the curtains first thing Race Officer Rob Lamb made the judicious decision to hold everyone ashore until conditions improved. At 11.15 the fleet was sent afloat and by the time they came to the line for race eight in the series they had around 13 knots from the southwest and the sun was breaking through. Again the Race Committee was able to complete three races, the first two of which were windward leeward's and the third a round the cans race. Once more it was cut and thrust on every leg of every race, both on the water and in the corrected time results. In the two windward-leeward races Michael Kershaw's Chimp and Jean-Philippe Cau's Sibelius virtually match raced around the course. Chimp went on to win both races with Sibelius claiming second in both. In race eight David Evans' Hullabaloo XV just pipped Robbie Tregear's Per Elisa for third by six seconds. In race nine it was the turn of Philippe Pilate aboard reigning Half Ton Classic Cup champion General Tapioca to fill the final podium slot. In the tenth race Francis Marshall's Concorde, General Tapioca, Hullabaloo XV and Chimp were locked in battle and the final beat, right across the central Solent to finish on the Royal Corinthian Yacht Club's line in front of the spectators on the Parade, was a delight to watch. On the line the boats were so close that the competitors couldn't be certain of the corrected time positions and there was a frantic rush back to the club house to find out the results, which revealed that Concorde had won with General Tapioca second, Hullabaloo XV third and Chimp fourth. In the overall standings Chimp has tightened her strangle hold on the lead and now has a 14-point margin over her nearest rival. Michael Kershaw has put together a strong young crew for Chimp at this event. On the helm is Ireland's George Kennefick, winner of a gold medal at the World Youth Games and one of Ireland's top young sailors. For George IOR sailing is in his blood (his father is the legendary Neil Kennefick of Quarter Ton Cup winner Manzanita fame) and he's been sailing Quarter Tonners and Half Tonners for several seasons. Also on the crew is Roger Merino, well known as one of the top Etchells crews and a regular member of the Chimp team. Graham Love and Ed Fitzerald who both have previous Half Ton Classic Cup experience and Ian Brown of Quantum complete the crew. General Tapioca continues to hold second place and is now 18.3 points ahead of Concorde. Tim and David Cunliffe's Insatiable has dropped down into fourth place and are now tied on points with Per Elisa. Two final races remain to be sailed and the regatta concludes tomorrow, Friday 26 August. The forecast is for more rain overnight and tomorrow morning with light winds during the first part of the day so the fleet has its fingers crossed that they can achieve two races before the 14.30 final start time cut off.